Hello All, I am back!Thanks for staying and exploring by blogs. I was busy in some important projects which made me delay to deliver new articles. 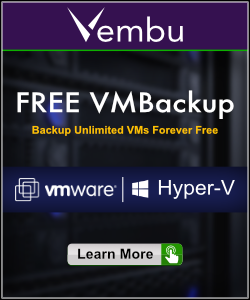 Here I am happy to announce and let me introduce "Vembu" as our new sponsor for VMwareInsight.com. Vembu is a leading provider of a portfolio of software products and cloud services to small and medium businesses for more than a decade and have customers in North America, Europe and Asia Pacific. Vembu’s vision is to make software and cloud services very affordable for the hundreds of thousands of small and medium businesses worldwide. Please explore here to know more about the products deliver by Vembu. Vembu CRM Suite is a user-friendly and affordable suite of products designed to empower companies to perform their end-to-end customer-management process from prospecting, lead and sales pipeline management, technical support to social media engagement.